When the horizon gives way to the coal mines, oil wells and power plants of the province's muscle corner, never will the deep southeast of Saskatchewan look sweeter than on this long weekend. Sweet as the taste of victory, and sweet as the sorrow of final goodbyes. For 40 humans and 40 horses, "Northward Ho" has been the trail call now for 133 days and nights. After crossing the U.S. border, likely on Friday or Saturday, and pulling back the reins one last time in Estevan, the riders will have completed an extraordinary horseback adventure unknown since frontier days, a journey up the gut of America, through Colorado, Nebraska and the Dakotas, roughly 2,000 miles that started with a touch for good luck at the Mexican border wall at Santa Teresa, N.M., on April 21. "These are some of the most magical people you will ever meet, and I doubt there will be many dry eyes when it's all over," says trail boss Tom Seay of his riding companions, both city slickers and veteran cowboys who have forged friendships for life under the starry skies and across the vast expanses. In keeping with the Patriot's Day Ride tradition, the AERC National Championship will be holding an additional raffle to benefit the Veterans Guest House in Reno Nevada. The Veterans Guest House provides US Military service Veterans and their families with caring support during times of need. It is a "home away from home" for Veterans receiving outpatient treatment and for families of Veterans who are hospitalized, at medical facilities in the Reno/Sparks, Nevada area. For more information visit the Veterans Guest House Website . Lyle Sherfey, horse ranch manager for Rush Creek Arabians out of Lisco, Neb., anticipates about 30 riders will compete in the upcoming endurance races to be held September 5 and 6, 2009. The beginning point of the races will be halfway between Lisco and Oshkosh on the south side of the highway; roads will be marked. Four races will be run over the two-day event; two 50 mile races and two 25 mile races. Each day the 50 mile race will be started at 6:30 a.m. and the 25 mile race will follow at 7:30 a.m.
"Rush Creek Arabians has raised horses for the sport of endurance racing for over 50 years and have held the Reunion races for the past three. Lyle said, "All the races are AERC (American Endurance Ride Conference) sanctioned. Riders may sign up from now until the morning of the race. "The races will be run in loops of 15 and 10 mile increments with the 50 mile race needing to be completed in 12 hours and the 25 mile in 6 hours," Sherfey said. "There will be two veterinarians on hand to check the horses, multiple times during the races at scheduled vet check sites. Head veterinarian will be Dr. Otis Schmitt from TN who travels the United States to vet endurance races and Dr. Richard Palmer out of Ogallala, Neb., who will be the treatment vet," Lyle said. "In addition there will be three to five people on hand at the PNR (pulse and respiration) stations to monitor the horses." "All the miles covered will be on Rush Creek Ranch land and will present a variety of terrain, from canyons to rolling hills with sandy soil. The 15 mile loop crosses a creek several times, providing horses the opportunity to drink and stay hydrated," Sherfey said. The type of tack is not specific and riders can choose to ride with a Western saddle, English or endurance and wear whatever type of head gear they like, expect for anyone under the age of 16 must wear a riding helmet. "In past years riders have come from Colorado, Wyoming, North and South Dakota, Kansas, Nebraska and a few from Montana," Lyle said. "Some have even come from as far away as Tennessee, Pennsylvania and Utah. Roughly 90% of the horses are Arabian with the rest being mules, Morgans, thoroughbred crosses and a few Quarter horses, with more of them in the shorter distance rides. A few people ride stallions, but not many. As far as gender of riders, females make up about 60-75% of contestants and overall ages can vary between 5 years old and eighty." Lyle himself competes in endurance races, but will have to sit this one out, since his horse Rushcreek Nerf recently competed in the Tevis Cup race in California and went on to another race and won't be back in time to run. Rushcreek Nerf, ridden by Laura Hayes from New York, came in 25th out of 172 horses, with only 51% completing the 100 mile race. The Tevis Cup is considered the toughest endurance race in the United States. Competitors will be able to camp at the race site overnight. A banquet of barbecue pork will be held each evening with an awards ceremony to follow. Awards will be given for the winners of each race along with, highest mileage horse and highest vet score as well as a turtle trophy for the last person to finish each race. A Best Condition award will also be given for each race, in memory of the notable Rush Creek Arabian endurance horses Rushcreek Ladd and Rushcreek Mark. The first 10 finishing horses in each race will contend for the Best Condition award. Many factors are taken into consideration and the ride veterinarians determine the veterinary portion of the criteria and ride management determines the weight and time portion of the award. Sherfey said, "The Best Condition award is considered more valuable to many than winning the race." If you need more information about this event you may contact Lyle Sherfey at (308) 772-4535. Put on by NASTR, this year's 100-mile Virginia City trail consists of three loops (51, 26, 23 miles), each returning to base camp in Virginia City. There will be an outlying vet check on the first and last loop, with (2) one hour hold vet checks at base camp. Crews will have easy access to meet riders along the trail. The trail covers hard pack and rocky terrain on historical wagon (now jeep) roads with some sandy single track footing and several mountain climbs. There is also pavement through town and across highways. Riders are responsible for their own safety while crossing paved roads. We do advise the use of pads and/or easy boots. Elevations range between 5000 and 7800 feet. Each loop will be marked with a different color of ribbon, along with chalk and glow sticks (after dark). Water & hay will be provided on the trail and at the two outlying vet checks. The ride will start in front of the Delta Saloon at 5:00 a.m., Saturday. NASTR, the Nevada All-State Trail Riders, Inc was organized in April 1968, for the purpose of preserving historic trails in Nevada by sponsoring and promoting horseback riding on these trails. In 1997, the IRS approved NASTR as a non-profit 501(c) (3) corporation. NASTR organizes three endurance rides a year known as the NASTR Triple Crown: the Nevada Derby 25/50 held in Palomino Valley, Nevada, the NASTR 30/50/75 held in Dayton, Nevada and the Virginia City 100 held in Virginia City, Nevada. NASTR takes part in multi-use trail promotion and preservation in Northern Nevada and Northern California. NASTR has representation on the Nevada State Ad-Hoc recreation trails committee and participates in Nevada state recreation trails planning. The organization also works with multiple governmental agencies and private land owners in keeping access open to multi-use recreational trails. Fund raising activities include an annual Stallion Service Auction, a Trail Trials event and raffles with donated prizes. This year's Virginia City ride is dedicated to Al Beaupre, who lost his battle to Alzheimer's on July 28, 2009. Al was a recipient of 20 Virginia City buckles, getting his 2000 miles in 2005. He also collected 8 Tevis buckles, and over 11,000 AERC miles along the way. Each year endurance riders from around the U.S. and Canada gather to compete for the American Endurance Ride Conference's top honors in the National Championship rides. This year, tiny Greenville, California (population 1,150) will be the launching point for the 100-mile ride on September 11 and 50-mile ride on September 13. Midway between Redding and Reno, the Northern California location has all riders ask of a trail: elevation changes, gorgeous views, shallow creek crossings, and wildlife sightings. "From the base camp at 3500 feet, riders will climb to 6040 feet on the first loop. There are a few good climbs, with the largest climb first thing in the morning," said Ride Manager Kassandra DiMaggio. "Besides a few rocky dry creek beds, the footing is really good. On areas with drop-offs, there is a wide road." At the trail's highest point, riders will be rewarded with views of Lake Almanor and the whole of Indian Valley. While riding alongside Walker Lake, riders can watch freshwater pelicans dive for fish. At the checkpoints, where the horses are examined by veterinarians before going on in the ride, DiMaggio plans to pamper both horses and riders. "We have food and water for the horses and we spoil the riders with drinks, candy and snacks." Later in the ride, the checkpoint closest to dinnertime will boast a barbecue dinner for ride participants. DiMaggio has hosted the Patriot's Day rides at the same site for the past several years, and is looking forward to welcoming high-caliber riders to AERC's premier event. 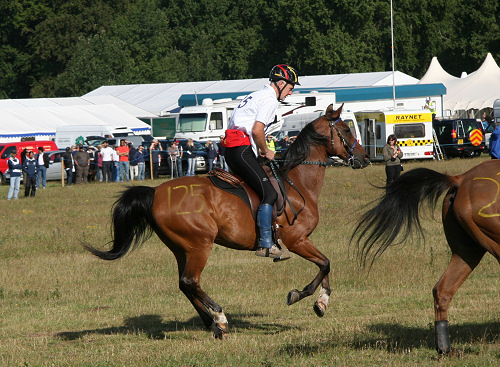 Riders and horses must meet a mileage requirement in order to be eligible for the ride, and there is no 25-mile distance for this event. Among the top endurance riders vying for the 100-mile championship is Joyce Sousa of Hydesville, California, who has placed in the top 5 of two previous National Championships. Sousa's 16-year-old bay Arabian gelding, LV Integrity+ ("Ritz"), has already completed 24 100-mile rides in 10 years of competition. "Ritz has done four one-day 100s this ride season," said Sousa. "I have to be careful not to overtrain for this ride. I basically concentrate on giving him plenty of rest and recovery time." On those four 100s, Ritz was first in two rides and second in two rides. His last competition was in mid-July so he should be rested and ready for a quick pace at the championship ride. Participants in the 50-mile ride are probably breathing a sigh of relief that one of their top competitors is riding just for mileage and not to win. Two-time endurance world champion Becky Grand Hart, of San Juan Bautista, California, is bringing her new bay Arabian gelding, No Repeat, and will likely sponsor a junior rider through the ride. "I'm looking forward to it," said Hart. "It looks like a beautiful trail." With 20,485 AERC miles to her credit, Hart enjoys both going for wins and riding along the lines of AERC's motto, "To finish is to win." "Don't look for us in the winners' circle," said Hart. "We are still getting to know one another." Hart, who serves as the U.S. chef d'equipe (team manager) for the U.S. endurance team, noted she will try to practice what she preaches to team members: no over-racing and adherence to another endurance adage, 'never hurry, never tarry.' "Mostly I am trying to make it through a 100 myself, enjoying the trail and the time with my horse." Awards will be given to the top three riders in each of five weight divisions in both distances. Saddles will be presented to the best-conditioned horses in both events and to the first-place finisher in the 100. The 50-mile winner will win a handmade cedar chest, to which a local artist will add the winning horse's portrait. Winners of both rides will also receive a ton of feed, courtesy of Purina. Gail Hought of Hought Tack has donated a great many gift certificates. The day between the rides will be filled with clinics and demonstrations, as well as the awards presentation for the 100-mile riders. DiMaggio won't get a chance to ride the trails while she is busy managing. What she'll miss most is coming back down to base camp at night on the Manzanita Trail: The single-track switchback winds around manzanita bushes, and it feels like you are on a roller coaster." For more information about the 2009 AERC National Championships, visit www.patriotsdayride.com. Watch out when the Andreotti sisters get that glint in their eyes, that subtle yet unmistakable look that passes between them. It usually means they're planning their next conquest, their next test of body and spirit, perhaps even a little mischief. "We always need a challenge," says Michelle Andreotti, 33. "Every weekend we say, 'OK, what can we do now?' "
The real question is: What can't they do? Sisters Michelle Andreotti and Susanne Andreotti-Rowland, 30, will spend this weekend in the Sierra foothill town of Cool to participate in the Coolest Ride & Tie, a 22-mile race along the Olmstead trail involving teams consisting of two runners and a horse they trade off riding. It will be the first competition for the sisters since June, when they made history by being the first all-women team to win the 39th World Ride & Tie Championships in Humboldt Redwoods State Park in southern Humboldt County. ENDURANCE horseracing takes not only talent and technical skill but plenty of patience. Hawthorne teen Jamie Green (pictured) is top in his field, taking out the Australian National Endurance Championships (160km Youth) at Imbil in June. The South-East Advertiser's YoungStar sports category winner started the race at 3am and finished at 5pm to clinch the title. Jamie's endurance riding success has been swift considering he only began riding lessons three years ago. "One of our neighbours was into it and we bought my first horse off them," he explained. "They asked me if I wanted to do an endurance ride with them and I just got hooked." The 14-year-old Churchie student said that an average endurance race lasted 10 to 14 hours. The horses were examined by a veterinarian every 40km. Mum Denise Green said Jamie spent every weekend and holidays at the family's Mary Valley property, training and riding his horses. "Living in Brisbane makes it difficult but his dad helps out by staying at the farm to do extra horse training before major rides, not to mention driving Jamie and his horses to each endurance event," she said. Jamie will travel to Victoria in September for the 160km Tom Quilty Gold Cup. Just as a sports team has an occasional huddle to review their game plan, Back Country Horsemen of America invites members to a National Board Meeting annually. This year's huddle was held in April at Fort Worden State Park, Port Townsend, Washington. BCHA extends its sincere thanks to this year's hosts, the Buckhorn Chapter of Back Country Horsemen of Washington and the Back Country Horsemen of Washington. The annual Board Meeting is the perfect time to educate, inspire, and inform BCHA members and leaders of BCHA member organizations. This year, BCHA provided training on the new U.S. Forest Service trails classification system. They further strengthened their relationship with the U.S. Forest Service and developed new ones with the Wilderness Society and The American Hiking Society. A number of organizations and individuals who share BCHA's vision attended and also presented. In addition, BCHA welcomed new affiliates that bring with them over 250 new members: Fort Harrod Back Country Horsemen, Inc. of Kentucky; Red River Back Country Horsemen of Kentucky; Big South Fork Back Country Horsemen of Tennessee; Pigeon River & Beyond Back Country Horsemen of Michigan; and Iron Mountain Back Country Horsemen of Virginia. BCHA is pleased that more folks from the east coast are joining with them in preserving our right to ride on public lands across America. Back Country Horsemen of America recognizes that keeping trails open for equestrian use takes more than the efforts of horse people; it requires the support and consideration of other trail users, too. That's one reason BCHA seeks out communication and interaction with others who enjoy our wilderness lands. The more common ground and mutual understanding they can attain with them, the better their chances of being understood and respected by public lands managers and other decision makers. BCHA's annual National Board Meeting has often hosted speakers who aren't necessarily horsemen, including national program managers from both the U.S. Forest Service and the U.S. National Park Service, as well as the Director of the Arthur Carhart National Training Center, where federal and state land managers are trained in wilderness management. The presence of such respected and influential people speaks volumes about their opinion of BCHA and its mission. This year, attendees were pleased to hear from Joel Holtrop, U.S. Forest Service Deputy Chief; three representatives from The Wilderness Society; and Randy Rasmussen, Senior Policy Manager at the American Hiking Society. In recent past, wilderness advocates and hikers were among those pressing for limitations on pack and saddle stock use in wild lands. But as the lines of communication have opened in the last year or so, they're finding that they have much in common. Back Country Horsemen of America, hikers, bikers, wilderness advocates, and other trail users all share a deep attachment to the back country, and a strong commitment to preserving those lands for the common good of all Americans. When they work alongside these other user groups, BCHA presents land managers with a broader picture of the wild land constituency. The Wilderness Act, Wild and Scenic Rivers legislation, and laws creating our National Recreation Areas were all made possible because of a broad base of support from preservationists and user advocates alike, not one single interest group. Working together we can preserve wild lands and the opportunities for responsible users to enjoy them. BCHA is pleased that they have surpassed their goal of $6 million in annual volunteer value. At their National Board Meeting this year, it was announced that the dollar value of the work BCHA members did nationally in 2008 amounted to nearly $6.7 million. That's 294,279 volunteer hours, plus other contributions from BCHA members, such as fuel, tools, and other supplies; training and certification; travel to work sites; use of power tools, heavy equipment, and horses and mules; and transport of equipment and animals to work sites. The importance of keeping volunteer records isn't just so that BCHA members can take pride in their accomplishments. These reports demonstrate the immense contribution BCHA and its member organizations make each year to building and maintaining trails for everyone's use. They also stand as a testament to the vast number of United States citizens who enjoy America's wilderness lands by horseback. How can public lands managers continue to ban horses from trails when so many of those trails are maintained by horsemen and horsewomen? Back Country Horsemen of America has set itself a new goal of $8 million in annual volunteer value in 2009. Ambitious? Yes. Impossible? Absolutely not! BCHA membership is growing every day, as folks across the nation join them in their quest to preserve our right to ride in America's wildernesses. These are people who love the land and love to enjoy it the way our ancestors did: from the back of a horse. And just like the Americans that came before them, these are hard working individuals who see a job that needs to be done and go do it. As the leading organization preserving our right to ride on public lands, it's fitting that Back Country Horsemen of America is also the primary provider of low environmental impact training to stock users nationally. To fulfill that role, BCHA announced at their National Board Meeting that Bob Wagner has been appointed as Manager of the BCHA Low Impact Training for Stock Users Program. Wagner graduated from the first BCHA Leave No Trace Master Educator Class in 2007. Prior to the Master's training, Wagner was already heavily involved in Leave No Trace training in Montana. After graduation, Wagner teamed up with Jerry Schottenhaml (Show-Me Missouri Back Country Horsemen) and Jacque Alexander (Buffalo River Back Country Horsemen of Arkansas) to form the Midwest Regional Leave No Trace Education Cooperative. They teach LNT Trainer and Awareness workshops across Arkansas, Missouri, and Illinois. IT'S a sight most people would not ordinarily expect to see in a kitchen - a fully grown horse standing by the window making itself at home. But for Widgee horse lover and endurance racing competitor Gayle Holmes, it's as normal as having man's best friend curled up at the foot of the bed. The horse's name is Faraway Verdict, a 29-year-old long retired champion from the adventure of endurance racing. Gayle says Faraway Verdict is more human than horse. “He has the most gentle nature I've ever seen in a horse,” she said. “It amazes people how calm he is and he has this ability to read my mood. In the kitchen, the line between outside and inside is greatly blurred, inviting disbelief. After all, kitchens are not designed with horses in mind. Gayle invites Faraway Verdict through the frontdoor, like any well-mannered host, and the horse takes a direct line to the kitchen. Once settled behind the sink, he pauses and looks out the window, perhaps wondering if the horses grazing lazily in the nearby paddock could ever dream of having the privilege of being able to go inside. Gayle offers Faraway Verdict a carrot, which he quickly devours, although with some difficultly. “He has a few back teeth missing, which makes it hard to chew at times,” she said. Once full of carrot, Faraway Verdict nudges the nearby packet of bread on the counter. Gayle obliges, offering a slice or two while the horse stuffs as much in his mouth as possible, perhaps worried his visit may come to an end before he has had enough to eat. With a final slice of bread for the road, Gayle gestures for Faraway Verdict to leave the kitchen. THE horse backs out with surprising grace and exists onto the front lawn to rejoin his stablemates. “One time during summer it was so hot we had the air conditioning going inside and he was standing at the front door with his head sticking inside to enjoy the cool air,” Gayle said. Gayle and Faraway Verdict first crossed paths when she purchased him to compete in a horse and camel race. It was during this time a fellow competitor suggested Gayle give horse endurance racing a try. “It was suggested to me that he would be well suited to endurance racing,” she said. After commencing the initial training, Gayle first climbed on Faraway Verdict in an 80 kilometre event and won. It was a victory that would pave the road for much future success. “The first year we had 12 rides and it was quite successful,” she said. In the time that has passed, Faraway Verdict has undertaken no less than 130 rides, rarely skipping a beat to be among the top finishes in each event. Included on his resume is a trip to America in 1996 (finishing 14th) and Dubai (winning bronze in the team event). In America, Gayle was the only Australian competitor to get through. “It was a shame the other Australians didn't make it but the competition was very tough,” she said. A staggering statistic involves the total number of kilometres covered in official racing - 11,300 kilometres. And that's not including the distance covered during training. It's success like this that has attracted the attention of many media outlets, including television that produced a 10 minute segment on the Totally Wild program. “Kylie from the show came out to see us and it was a great experience to be a part of,” Gayle said. In recent years, Faraway Verdict had had a few troubles with his health, including a period of time last year when he was “all skin and bone” after dropping a lot of mass. But Gayle, who said he was fearful of losing her mate, is happy to say the horse has drastically improved this year and has bulked up significantly. “He has recovered so well and I'm very thankful about that,” she said. Although his days traversing the landscape with his companion Gayle have ended, a well earned retirement and the odd adventure into the kitchen of Gayle's Widgee property ensures this horse has enjoyed the best of both worlds. And it can be certain Faraway Verdict wouldn't have it any other way. ALVIN — While many people head to the gym to stay active, Alvin resident and Alvin Community College computer instructor Mike Maul heads for the saddle. Since the mid-1990s, the former Silicon Valley engineer with a Ph.D. from MIT has been challenging himself — and his horses — by competing in endurance races throughout the southwestern United States. Sanctioned by the American Endurance Ride Conference, the events are classified by categories including 25-, 50- and 100-mile rides. For many competitors, the Western States Trail Foundation Tevis Cup Ride is the epitome of the sport in America. Considered the “oldest modern-day endurance ride,” the event takes riders from Lake Tahoe, Nev., through the “High Sierra” into California. According to Maul, to compete in endurance racing both the horse and rider need to be conditioned and maintain top health throughout each event and off season. Maul’s interest in riding was eventually spawned by his wife, Cyndi, who has been riding for 38 years and competing in dressage shows for more than 25 years. “I didn’t learn to ride until after I was 50,” he said. Despite both their love of horses and riding, they seldom ride together. “We have six horses between us and one of us has to stay home when the other is away. When she’s showing, I’m home taking care of the other horses and when I’m competing, she’s home taking care of them,” Maul said. For information about endurance racing and the AERC, visit www.aerc.org. The “Journey of Death” doesn’t sound like a welcoming route. The trail – a 100-mile waterless stretch through the desert that was used by early Spanish travelers heading north into New Mexico – got its name from the many that have perished along the way. Londrey, 26, spent three days riding along the “Journey of Death” alongside about 15 fellow riders, who are all participating in a five-month horseback riding trek from Mexico to Canada. Although the journey was tough, the group – which was only a portion of the trip’s approximately 50 total riders – had the luxury of traveling with a truck carrying containers of water for both the horses and the riders. Even so, the travelers had to cut back on their water intake in order to make sure the horses would be adequately hydrated. Once the riders re-joined the rest of the group in Truth or Consequences, N.M., they were “pooped beyond belief” both mentally and physically, Londrey recalled from his cell phone earlier this summer while stopped along the route in La Junta, Colo. But Londrey was nowhere near finished with his journey from border to border, which started April 21. At the time, the Syria resident, and the rest of the participants of the trip, which was organized by the “Best of America by Horseback” trail riding television series, had only traveled about 650 miles of the total 1,800-mile journey. However, the group was about to celebrate an important milestone for the television series, which Londrey films, produces and edits. As the riders arrived in the town of La Junta, they officially reached the show’s 100,000-mile cumulative trail riding mark traveled by all participating riders since the start of the series, which is hosted by Culpeper resident Tom Seay. The show’s host is also known locally as a former Madison County horse trail guide for Graves Mountain Lodge and Aramark, a private company, that guides rides in Shenandoah National Park. The World Games 2010 Foundation today announced that Kentucky-based Tarter Farm & Ranch Equipment is now the Official Provider of Equine and Livestock Management Equipment of the 2010 Alltech FEI World Equestrian Games. Beside the big stars, not shy at all, in his shining coat and still lead by his warrior's spirit, there is a little bay guy with three socks. In his mind, he still think he can rivalize with the cream of the crop, go faster in the difficult parts while keeping his outstanding balance, or even cover two loops without drinking, or playing with the traps of the trail... From time to time, his rider was dreaming about new successes, but nevertheless he didn't want to let him go as fast as he want. He didn't want taking any risk for his - last - race. "TO FINISH IS TO WIN"